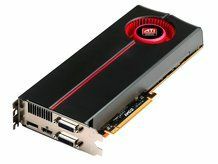 AMD has dropped the first salvo in the DirectX 11 graphics war – its ATI Radeon HD 5870 card is available from today. At its presentation to preview the launch of the new technology, AMD insisted it was following its "sweet spot" pricing strategy, but AMD says its new card will be on sale for around £310. That's a little more than we were expecting, but not surprising given that Nvidia hasn't yet showed any DirectX 11 hardware. The specs of the new card are awesome – 2.7 gigaflops of compute power, enabling up to 24 megapixels of gaming performance (with ATI Eyefinity). Indeed the chip is so powerful, it equates to an incredible 177 IBM Deep Blue supercomputers. The card is an awesome piece of kit housing ATI's second-generation 40nm chip and fifth-generation DDR5 memory. The core clock is set at 850MHz, while 1,600 stream processors. This obviously requires a lot of power – 188W at max load, 28W more than the current generation. However, AMD rightly claims kudos for reducing the idle power draw right down to 27W. The standard dual-slot 8750 can drive three 2,560 x 1,600 displays through its various connectors – it includes two DVI ports as well as HDMI and DisplayPort. An HD 5850 will also be available in due course, complete with 1,440 stream processors and clocked at 725MHz. Max power draw is 170W. AMD says the card will be less than $300 (£183) so expect the card to hit the sub-£200 price point. Expect other variants in due course, though as is usual AMD didn't have much to say about those at this time. "Graphics matter more than ever" and "the game has changed" were the taglines applied by AMD to the presentation a couple of weeks ago in central London. AMD continues to talk up its forthcoming Fusion combined CPU/GPU technology that will debut in 2011. AMD assures TechRadar that etailers Scan, Novatech and CCL all have immediate availability on the HD 5870. At the event AMD also previewed its Eyefinity six-monitor display technology which deploys a special variant of the 8750 complete with six mini DisplayPort connectors. Make sure you check out our ATI Radeon HD 5870 review.